We have seen our fair share of upheavel this college football season but one thing remains clear, Alabama is the best team in the country, and we certainly saw that yesterday in a wet afternoon on Missouri in which the Crimson Tide manhandled the Tigers, 42-10, highlighted by T.J. Yeldon's awesome diving touchdown run in the second quarter. 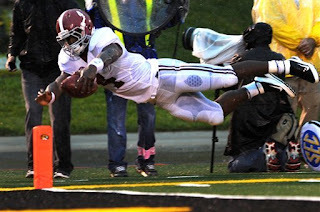 The Tide are looking like they'll be in the BCS Championship Game this winter but who will they potentially face? And how about the rest of the 35 bowl games? It's the first edition of the B-FLO 360 bowl predictions for 2012.